Astronaut Harrison Schmitt uses an adjustable sampling scoop to retrieve lunar samples during the Apollo 17 mission in December 1972. Newly restored lunar data tapes show the Apollo astronauts’ activity warmed the Moon’s surface slightly. Credit: NASA. Scientists have wondered about the cause of the warming since soon after the Apollo missions started, when astronauts deployed probes on the moon to measure the heat coming from its interior. The lost data tapes recovered by the scientists filled in a record gap during the 1970s and helped the researchers pinpoint the source of the warming as the Apollo astronauts themselves. 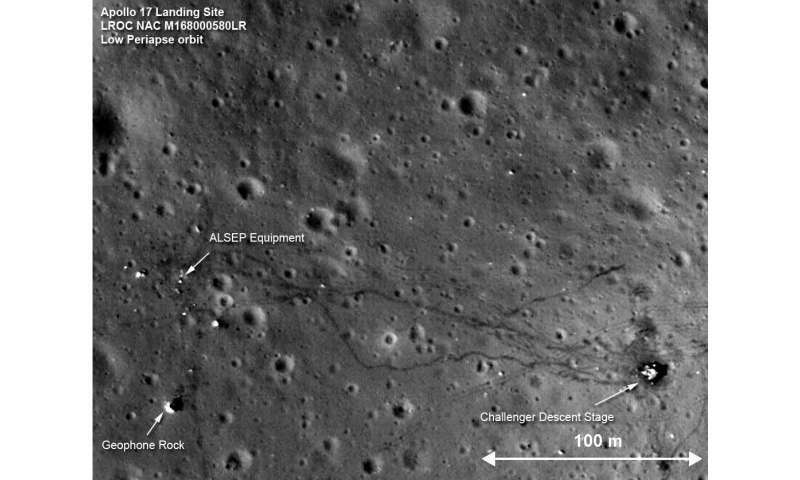 The astronauts disturbed the moon's surface soil by walking and driving a rover on it. As a result, the moon reflected less of the Sun's light back out to space, which raised the lunar surface temperature by 1-2 degrees Celsius (1.8-3.6 degrees Fahrenheit) where it was disturbed. The new findings show it is almost impossible to deploy astronauts or instruments on the moon without disturbing its surface environment, information that could be valuable for future lunar missions, according to the researchers who published a new study detailing the results in the Journal of Geophysical Research: Planets, a journal of the American Geophysical Union. "In the process of installing the instruments you may actually end up disturbing the surface thermal environment of the place where you want to make some measurements," said Seiichi Nagihara, a planetary scientist at Texas Tech University in Lubbock, Texas and lead author of the new study. "That kind of consideration certainly goes in to the designing of the next generation of instruments that will be someday deployed on the moon." During the Apollo 15 and 17 missions in 1971 and 1972, astronauts deployed probes to measure the moon's subsurface temperature and tried to quantify how much heat moves from the moon's core to its surface. Scientists expected these heat flow measurements would tell them whether the moon's core was hot like Earth's and how much heat the rocks of its crust and mantle could generate. 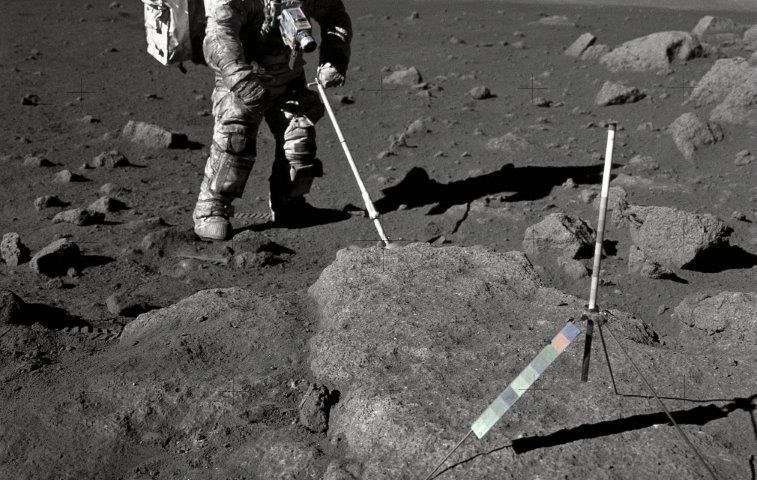 The probes measured temperatures at the moon's surface and a few meters down into its subsurface from 1971 to 1977. The raw temperature data was transmitted to NASA Johnson Space Center in Houston, where it was recorded on open-reel magnetic tapes. Technicians then gave the tapes to scientists involved in the mission who analyzed the data and archived them. But when the heat flow experiments ended in 1977, only tapes from 1971 to 1974 were archived at the National Space Science Data Center, the NASA space science mission data archive at Goddard Space Flight Center in Greenbelt, Maryland. The rest of the tapes, presumably still with the scientists who analyzed them, were never archived, and most have been lost ever since. In 2010, Nagihara and several colleagues decided to track down the lost heat flow data from 1975 to 1977 to answer some outstanding questions. One long-standing mystery was why the moon's subsurface temperature gradually increased in the years after the heat flow probes were deployed. Planetary scientists debated the cause of this unexplained warming for several decades. Some suspected it was due to the astronauts' activity, while others thought it could have been due to changes in the moon's orbit or excess radiation coming from Earth. When the researchers started searching for the missing data, they discovered NASA had created a separate set of tapes specifically for archiving. They found 440 of these archival tapes, with data from April through June 1975, gathering dust at the Washington National Records Center in Suitland, Maryland, which stores records from several U.S. federal agencies. At the Lunar and Planetary Institute in Houston, the researchers recovered hundreds of weekly logs that recorded temperature readings from the heat flow probes from 1973 through 1977. These logs helped the scientists reconstruct the temperature readings for the times not covered in the archival tapes – January through March 1975, and July 1975 through February 1976, when the instruments began to reach the end of their functional lives. It took the scientists several years to extract data from the decades-old tapes and several more years to analyze their contents, including recovering documents describing how each probe was calibrated and how to process the data each probe recorded. The missing tapes and the weekly performance logs gave the researchers enough new information to tease out a likely cause for the mysterious heating. The probes closer to the surface saw a greater temperature jump and saw it sooner than the probes deeper down, suggesting the heat started from the surface and moved downward. The researchers also paired the new data with images of the moon's surface from the Lunar Reconnaissance Orbiter. 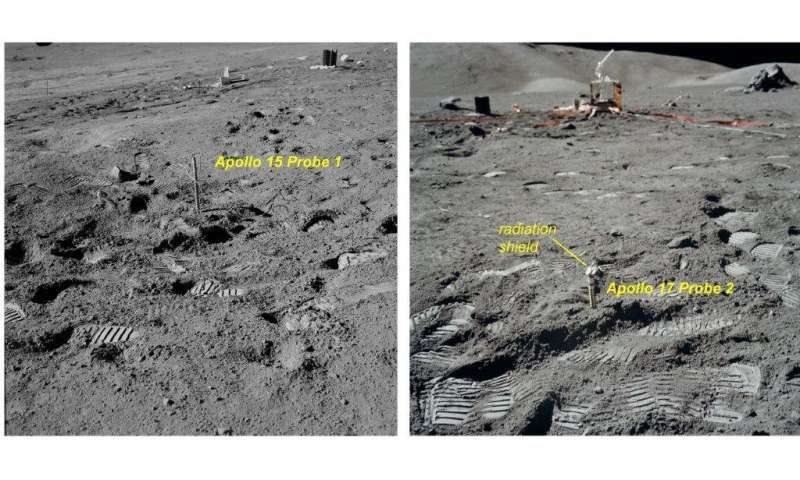 The images show the astronauts' activity disturbed the surface environment at their landing sites, which darkened the lunar soil in those areas. Darker soil absorbs more light from the sun, which makes it warmer, and the researchers suspect this is what caused the warming. "It doesn't take much disturbance to get that very subtle warming on the surface," Nagihara said. "So analysis of the historic data together with the new images of the moon really helped us characterize how the surface warmed." is out of the question, then? Ok, so we can literally blame moon-warming on the shade of dust exposed to light but we're going to completely ignore the hundreds of millions of homes in the world with black asphalt and tar roofing. Let's not forget the tens of millions of miles of black road in the world, black cars, etc. I swear, people are so stupid it baffles me. Want to reduce human impact on weather stop making the surface of the planet black, obvious win. Yeah, gases are bad, too - but the former is far easier to accomplish as it requires no real advancement in technology. That imagery is fifty years old now! Yep. And is the height of what we have achieved. And it was in 1969! Bit sad, is that. Anonym857382, they aren't clear but I think they were saying that the probes and astronauts working around them exposed the darker soil and warmed the soil around the probes. Not the whole moon.